If you’re a seasoned Japan visitor (or an adventurous first-timer), I would recommend trying the two least-known JR Passes: the San’in-Sanyo JR Pass, and the All-Shikoku Pass (for another post). The San’in-Sanyo JR Pass covers a vast area from Kyoto down to Fukuoka and the historical heartland of Japan. My post focuses on the least-visited prefectures of Tottori, Shimane, and Yamaguchi because these local places are where the tourist crowds thin out and the thick layers of history are well settled. I went in the first week of April, just after hanami season started. Many of the places we went to including Matsue Castle, Izumo Taisha, Ritsurin Garden in Takamatsu, and the Kintai Bridge at Iwakuni had full bloom trees with fresh snow pedals fluttering through the breezes. Purchasing a Pass Overseas (¥22,000/~US$220) You can order a voucher in your home country, which you can receive and exchange in Japan. Note that this pass cannot be purchased in Tokyo because that is part of JR East, a different company. JR East, JR West, JR Kyushu, JR Shikoku, etc. are all different companies. Redeeming your pass at one of the above stations if you ordered it overseas. When redeeming, tell them the date you want the pass to start, otherwise it will be assumed as the same day. Types of trains valid for: Shinkansen (Non-Reserved Seats, Reserved seats only if pre-booked at ticket offices and I find unnecessary). Express, Limited Express, Rapid Service, Local trains. How to board a train: Show your pass to a station attendant to walk into the station. Walk onto any JR train that has free seating or the Non-Reserved seat compartment. Show the station attendant who walks by on express trains. Show the station attendant to exit. It’s as simple as that. Great benefits: You can go anywhere any time whenever you feel like it. You can hop on and hop off Shinkansen. Also: the JR ride from Yonago down to Hagi along the Sea of Japan is breath taking during sunset. Please check my rural Japan tips for additional info. This area, collectively known as ‘Chugoku’ (the middle kingdom) is the seat of much cultural and historical significance. The lords of that region, especially Yamaguchi Prefecture, were instrumental in overthrowing the last shogunate (the Bakufu) and ushering in the Meiji Restoration, Japan’s great modernization era. In contrast, neighbouring Shimane Prefecture is home to the Izumo Taisha (Grand Shine) is one of the two places the founding gods of Japan descended onto earth. It is mentioned in Japan’s oldest recorded, the Kojiki, putting it on par with its more famous cousin, the Ise Shrine in Mie Prefecture. This region is where the settlers from the Korean Penninsula settled as they moved northward from Kyushu. Cities such as Hagi were known for their pottery and scholarly learning and to this day carry a rich poetic legacy. The Seto Inland Sea, a national park, was host to Japanese pirates, naval battles, hermits, and exiles. Yashima was the site of the second last battle in the Genpei War that ushered in Japan’s first shogunate. At the turn of the 20th Century, the Treaty of Shimonoseki was signed after the first Sino-Japanese War, where China ceded Taiwan, various islands, and vast parts of Manchuria to Japan. Now, the island of Naoshima is host to one of the world’s most famous open art exhibitions. And yet, this region’s historical landscape is equally matched by some of the country’s most unusual scenery. Omi Island has jagged island rock formations. The Akiyoshidai has high alpine caves. Daisen is one of Japan’s Seven Holy Mountains, and Tottori graces Japan with sand dunes. And, of course, there’s the food. Shimonoseki for fugu (puffer fish), Izumo and Matsue in Shimane Prefecture compete for national soba reputations. Yamaguchi has kawara soba (noodles cooked on rooftop shingles). Crab must be enjoyed in Yonago. Iwakuni has block sushi. So with that, let me go through a brief list of highlights by prefecture and town that I visited. Mount Daisen, a sacred mountain that commoners could not climb on until the Edo Period and the region’s tallest. Eat Yonago crab, and use the Tabelog (Japanese Yelp) for inspiration. Would suggest searching in Japanese if you can read Chinese / Japanese. Much more info. The soft ice cream at Yonago Station is also very good as a random piece of info. Matsue City is nice and walkable. It has a castle with a moat and has many noodle places. Also has a gorgeous sunset over the massive lake — good for dinner. If you go during hanami (cherry blossom) season, the trees around the castle will be in bloom. Izumo Taisha (Grand Shrine), which is at the end of the tram line that connects to Izumoshi JR Station. Give yourself 2-3 hours to enjoy the grounds, maybe have a picnic in the grass and enjoy the cherry blossoms in Spring. Try the local Izumo soba buckwheat noodles (preferably just off the main shopping street leading up to the shrine). I generally prefer soba without soup and their specialty is a trio mix of three different types. To be perfectly honest, my absolute favourite is still Shinshu soba from Azumino in Nagano Prefecture as I prefer a nuttier flavour and firmer texture. But it was still very good! We tried Arakiya, which is locally ranked for soba and quite good. Their real gem is the soba zenzai (mochi-like sweet in red bean soup). Take a train along the coast during the evening to watch the sunset over the Sea of Japan. Hagi is a perfectly preserved historical town and has many pottery shops still open. The preserved historical buildings have local businesses like Zakka COTOCOTO Cafe and Ruco Guest House (also a cafe), as well as preserved homes. Cruise through the Omi Island rock formations (optional, the motor in the boat is sadly quite loud). Visit Yuda Onsen town for the free public footbaths. The Rurikō Temple within one station’s walking distance has a pagoda that is a cultural heritage and gives an authentic feeling of what a temple really should be like (sorry, the Asakusa Senso-ji is a commercial trap). Also try the Kawara Soba (Shingle noodles), which is a regional speciality. Visit Hofu and Tenman-Gu Shrine on the hill that has a gorgeous platform area for reading a paper with the sea, mountains, and settlements in between stretched out before you. Chill by the Iwakuni Kintai Bridge, try the ice cream shop with some 100+ flavours, stroll through the Kikko Park or chill at the river or walk up to Iwakuni Castle. Have dinner at Hirasei to try Iwakuni block sushi around sunset on the 2nd floor to watch the lights come on at the bridge. You hang around long enough like I did, visit the local shops in the central area like Himaar Coffee and Crafts. Spend a day, or two, in Shimonoseki. If nothing else, for the sheer number of independent cafes spread throughout the city. Try Karato Fish Market (mini Tsukiji) and the local fugu (pufferfish), but go super early when the fish is still fresh. The market is open until 6pm and does have lots of tourists (be warned). It is a great place to wander in and out to sample whatever catches your eye while eating it along the sea — staring over Kyushu, home of tonkotsu ramen. The area around Karato has been redeveloped and may seem a bit “commercial”, but it has more of a lively bustle than an overwhelming tourist attraction ambience.If you want a break, we sat at the cafe in the Former British Consulate virtually across the street. Miyajima Island to see the Itsukushima Shrine. 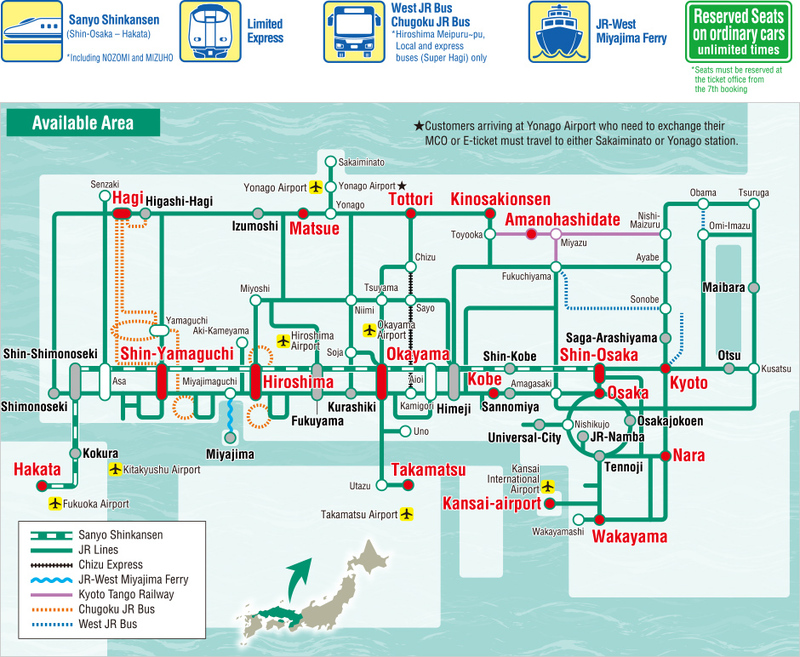 It is 1 hour train ride from both Hiroshima and Iwakuni. I took the first train and boat there and thoroughly enjoyed the place to myself, at low tide, with plenty of time to take photos right under the grand Torii gate under the first light of day. By the time I was done and the tourists started trickling in, the tide had also washed in. I highly recommend enjoying this place at sunrise for the peace and quiet — so either stay overnight or take the first train. The last boat leaving is in the afternoon. Finally, there are so many places you can just go because you can with your JR Pass. This pass is not available to locals, who would never think to “just” ride a train to try a bowl of noodles. But you can — and I have taken advantage of this often.